We will be looking how Apple uses product launch strategies and how you could do the same. The iPhones, Apple Watches and AirPods themselves will be spoken about for just as long. Reviews and debates will go on and on. All of this despite the fact that to most consumers the iPhone 7 looks and feels pretty similar to the iPhone 6S. Apple has clearly perfected the product launch, generating a massive buzz even when they’re launching something less than revolutionary. While Apple has a reputation that you can only dream of – which is obviously a major factor – most of the marketing techniques they use for their launches will almost definitely work for your product too. Let’s look at what Apple gets right, and how you can follow their lead. When I worked on the Blocks modular smartwatch launch, I spent months getting people hyped. We built a community of nearly a hundred thousand loyal customers – and the product will only be available this December! You can find out more about that here. By using my three-stage strategy of Imagine, Excite, Get Backing, we let our fan base do half the work for us. Sometimes we hosted discussions on our social media pages, but often they came about organically. Once you have a dedicated community, your launch is guaranteed to generate hype. Apple does this incredibly well. They recognise the power in a simple image of an iPhone. If you head to the Apple website now, you’ll see an image of the new iPhone with the words, “This is 7”. It’s not even a great font. But they know that does not matter. And for those who are interested, the finer details are just a few clicks away. While images of your product will not evoke the same thoughts and feelings that an iPhone 7 does, you can learn a lot about keeping your own marketing simple. If your product looks really cool, don’t overload the page with text. If not, find a way of expressing the most attractive features without over-explaining. In a 2015 study, researchers found that content that evokes a high level of positive emotional arousal is most likely to go viral. 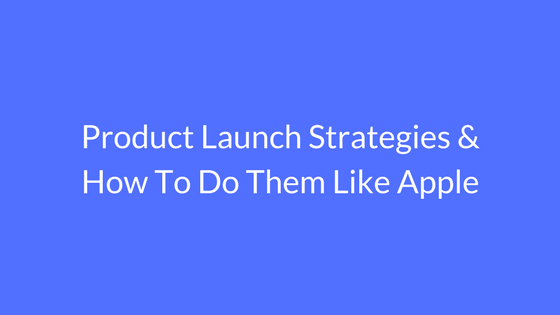 In particular, the most effective product launch strategies evoke laughter or awe. Or both. Apple has always used awe as a way to get people hyped. They’ve been so reliable at wowing us for so long, that we expect our minds to be blown at every launch. Tim Cook is perhaps not as good at it as Steve Jobs was, and it’s been a while since Apple turned the world upside down. Nevertheless, we want to be awed and wait in anticipation every September. Apple has an incredible reach, and getting access to the good press is not hard for them. Furthermore, they can afford to distribute samples of their products in exchange for reviews. And don’t discount internet personalities, either. Bloggers and YouTubers have hundreds of thousands or even millions of followers. If they review your product, there will inevitably be a large sector of their followers who are interested. One of the things that Apple have truly perfected is the art of a launch event. They don’t have a shoddy slideshow with a marketing executive trying to talk up their products. Rather, they have CEO Tim Cook on stage, broadcast via streaming around the world. Some people are content for just a summary of the main points. But many others want to be part of the event. They want to find out about the new iPhone at the same time as everyone else, with all the pomp and ceremony.